Shoing has been in various roles on KoL, and is now a GKOL DJ! He is a 22-year-old college student from Northeast USA, where the sun can shine brightly with all its might but still be 40 degrees outside some days of the year. Other than being a student, Shoing enjoys sports (especially basketball) listening to AND writing music, biking, reading, and watching movies, among other ridiculous (and not even funny) things. Shoing will really play anything... so long as he deems it "good" music. Typically, his intent is to stay within a particular genre for a period of time. If it's an early morning show, relaxing music or energetic music will be played at listener discretion, whichever would most appeal to those tuned in. However, there may be times where random songs are played, dependent on mood. And, of course, Shoing will always do his best to please the masses, as his library is fairly diverse. Requests can either go through K-Mail (Shoing, #114524) or e-mail (shoingy.kol@gmail.com). Requests through /msg can be confusing and get lost, as Shoing keeps track of a lot of channels/messages at the same time. He will do his best to have your request. Donations are certainly not necessary, but will not be refused. 100% of any donation to Shoing (#114524), whether 1 meat or 1 million, will go towards prizes. But please, support any DJ you like, it is a team effort! 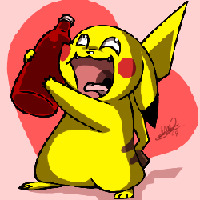 Or send Pikachu ketchup, as my picture proves the positive results of doing so.